Joe Don Baker stars as Mongo Nash, a professional gunman and the brother of mob boss Mike Nash (Charles Cioffi). Mongo's brother needs someone killed, so Mongo heads home for Christmas to take care of it. 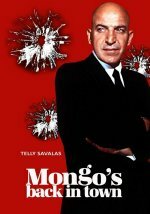 Meanwhile, police lieutenant Pete Tolstad (Telly Savalas) follows Mongo's trail. Partly filmed along the waterfront of San Pedro, CA, this made-for-TV thriller was based on a novel by E. Richard Johnson, who was then doing time on a robbery-murder charge.